From the makers of TurboTax and QuickBooks comes Quickbase, a project management software that makes taking projects from start to finish far simpler than before. Intuit has been building solutions that make the difficulty of getting projects done much easier for nearly 30 years. Intuit is often mentioned as one of the best places to work and takes pride in its social mission to offer its resources to people around the world who do not have direct access to them. Quickbase is part of Intuit’s current mission: giving people the power to go further with projects. Project managers often have many tasks to do at once, and an intuitive project management software can save them valuable time by streamlining tedious processes. Quickbase is a cloud-based task management software that allows users to jump in quickly, requiring little training time. Users can customize this platform to accommodate workflow without knowing how to manipulate the back-end of the program. Simply add, remove, and swap features with different options as projects and expectations take shape. Team members can customize reports and easily integrate data from other sources as well. Instantly available from any browser or mobile device, this application allows users to build workflows to manage approvals, orders, trouble tickets and more with smart forums that trigger automatic data updates and action. Quickbase even has security options that allow you to protect private information such as role-based security. Use this project management software to focus more on the projects themselves rather than what it takes to keep track of them. 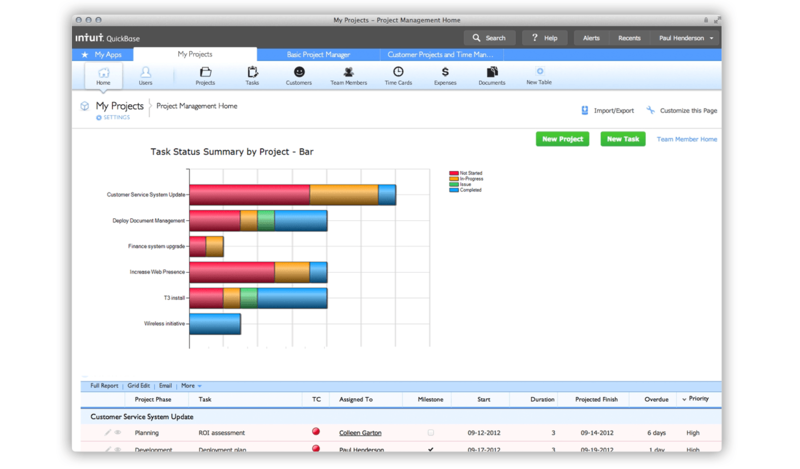 See more enterprise project management software solutions using our Project Management SmartAdvisor. Learn everything you need to know about Intuit Quickbase. Our experts will reach out to you shortly.